Tarot cards could tell you more than just your future; they can also guide guests to their seats. High-school sweethearts Amanda Erickson and Chris Maher wanted their summer wedding to blend modern and vintage styles into their festivities at Portland’s Rhododendron Garden. The deck, a reprint of the classic 1970s Aquarian Tarot and purchased at Powell’s Bookstore, did just the trick. 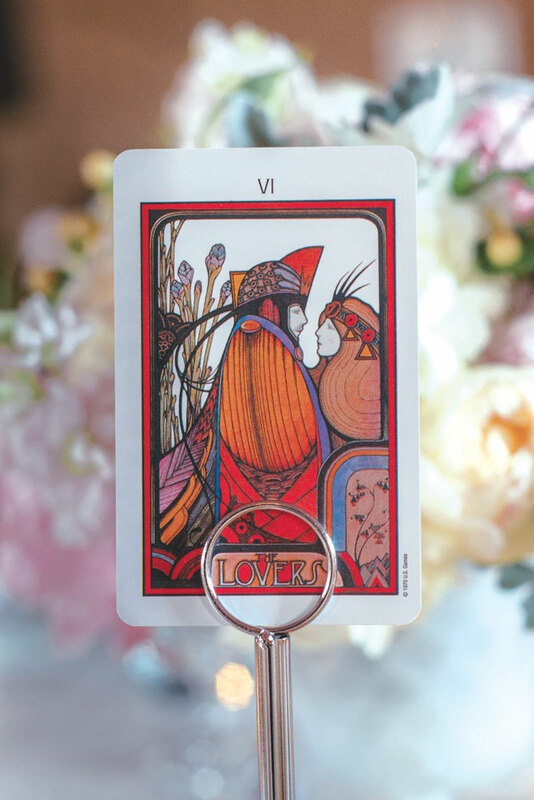 Of the 78 cards in the deck, Amanda and Chris used 15 of the most intricate cards for their table numbers, showing images from the tarot deck that included lovers, the sun and the moon. “We loved how these cards gave an Art Nouveau style to our tables,” says Amanda, though it doesn’t take a card reader to appreciate this cute idea.